Madison Harper is glad to be alive after a devastating auto accident. She loves her new community, too. There's something peaceful about the Heart's Haven cottages. Madison wakes up every morning, praising the Lord and basking in constant sunshine--until the day Andrew Hart collapses from a massive heart attack and dies. She didn’t miss too many opportunities these days to praise the Lord. After two years of hospitals and rehabilitation, she was extremely grateful to be outside, beneath the golden sun, working the soil and basking in the glory of God’s creation. She was glad just to be alive…gardening was a special bonus. She never thought she’d have full use of her leg again, let alone bend it beneath her like it was right now. She rubbed her thigh absently, as the memory of careening down the snowy hillside and slamming into the tree flashed through her mind. Her fingers clenched into the soil. Not so long ago, that image would have sent her into a panic attack. She was in coma for two weeks after the accident. When she woke, her leg was pinned and immovable, and her mind was just as weak and frightened. Two operations later, doctors were convinced she’d never walk on it. Madison had almost started to believe them when her friend and mentor, Vivian Mallory, intervened. Vivian was right. 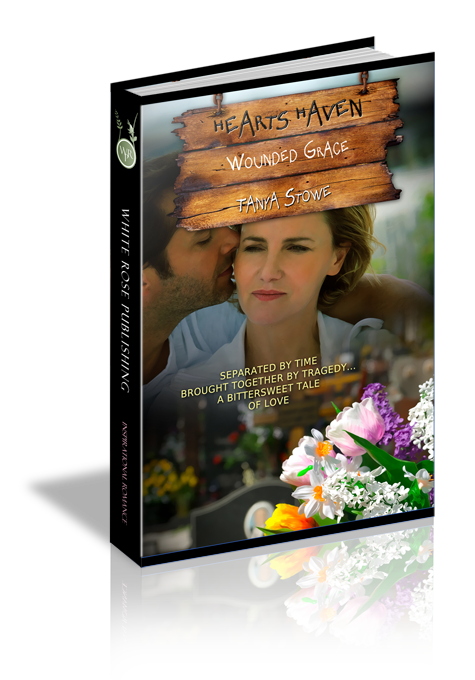 God did want Madison to walk again, and run, and even to move to this little bungalow complex in the corner of southeast Texas where she could discover how much she liked to dig in the earth. Madison looked up. Andrew Hart, Vivian’s husband and owner of Heart’s Haven stood above her, leaning on a shovel. As she looked straight up, sun flashed all around him, so bright she could barely see the smile, hovering over his lips. His tone might have been grumpy but Andrew knew better than anyone what this activity meant to Madison. Even with her arm shading her eyes, the sun was so bright around Andrew she could barely see him. He shimmered with a golden aura. But she could hear the weariness in his tone. Andrew was almost eighty but still as active as a fifty-year-old. If Madison could have seen his face, she was sure she’d see one eyebrow raised, but he never said a word. He didn’t have to. Madison knew what he thought of her suggestion. Smiling, she went back to work. A wedding was coming to Heart’s Haven. Kaci James and Ryne Calvert, two residents, were getting married in the Heart’s Haven central court. Kaci had asked Vivian for her expertise as an interior decorator to help plan the wedding, and Mr. Hart was determined to make the complex postcard perfect. He’d hired painters to white-coat the big house and the bungalows and even enlisted his nephew Kevin to design and color coordinate all the grounds. Madison slid a delicate paperwhite plant out of its plastic container, placed it in the ground and carefully filled soil around it. The flower was barely blooming but it already carried a sweet scent that drifted gently upwards. Behind the two rows of paperwhites was a bank of yellow daffodils. Next, Madison would plant a full tray of purple grape hyacinth and finally another tray of purple crocuses with yellow and white centers. Purple, white and yellow would be in full bloom everywhere on the grounds. They didn’t know about the wedding in time to plant bulbs. Kevin had to special order all these early spring plants from a nursery. It had cost a small fortune for plants so close to blooming, but Mr. Hart had declared it “worth every penny.” As Madison looked around at the sweet-scented, colorful flowerbeds taking shape, she had to agree. A trickle of sweat worked its way down Madison’s spine and eased beneath the band of her pants, tickling all the way. She was hot and starting to get itchy, but her discomfort only made her smile again. “Thank you, Lord. Thank you for the opportunity,” she whispered. She slid the first of the tiny grape hyacinths out of its plastic container and dropped it in a hole. Without warning, a shadow covered the ground where she worked. Madison leaned back on her legs. Moments ago the sky had been clear. She looked up. There wasn’t a cloud anywhere to be seen. The sky was as clear blue as it had been moments before. Madison’s gaze jerked back down to the ground. All of her plants were still cast in a large, undefined, dark shadow. Where in the world was it coming from? Suddenly, the shovel Mr. Hart had been holding fell in front of Madison, crushing the tiny hyacinths and paperwhites she’d just planted. Madison gasped as Mr. Hart grabbed his chest, fell to his knees, and rolled over in the dark, warm earth. Madison ripped off her gloves and crawled to his side. He was curled in pain, clutching his chest. “Mr. Hart!” Shock swept through Madison. Heart attack. He was having a heart attack. What should she do? “Help,” she murmured barely able to get the words past her frozen lips. Mr. Hart convulsed again and that spurred her into action. “Help!” She turned and shouted across the complex yard where Kevin and his crew were forming another flowerbed. But the pain was too great, too sudden. All he could do was clutch his chest. Madison reached for him, wishing she could do something. He grasped her hand and tried to turn his head to see her. She lifted him gently onto her lap. He wanted to speak, but couldn’t. Tell Vivian he loves her. Her words eased his pain. He released his chest, looked at a spot just above her shoulder and smiled. Then his eyes closed.